UK global fashion brand REISS will be opening a store at Melbourne’s new $200m luxury retail precinct, St. Collins Lane. Having recently reached 40 per cent leased throughout the centre, La Salle Investment Management confirmed that REISS will join the centre’s stable of premium and luxury brands with a 122sqm store when it opens in 2016. La Salle Investment Management’s Regional Director of Asset Management, Simon Howard, said the recent signing of key international brands such as REISS, along with recently-announced tenants, Paris fashion houses Sandro and Maje, signified a coming of age for Melbourne as a luxury fashion destination. 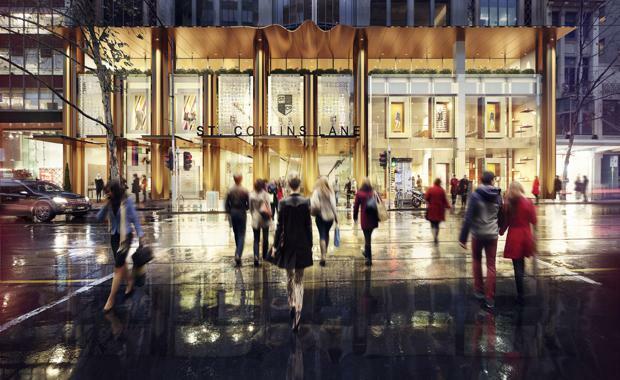 “It is testament to the St Collins Lane vision that we are seeing such a strong set of iconic brands which have never had a presence in Australia before, reinforcing the fact that the centre is truly set to revitalise the Melbourne shopping scene. With its diverse stable of clients, St Collins Lane will be both traditional and forward thinking, international and local, open and intimate,” he said. The majority of the centre's flagship stores are leased to the likes of premium international brands Coach, TAG and Furla. With demolition now complete, the focus will now be the internal finishes before tenant fit-outs are earmarked to commence later this year. Formerly known as ‘Australia on Collins’, the premium retail site is currently undergoing a $30 million refurbishment to transform the centre into a luxury fashion destination in the heart of Melbourne’s shopping precinct. Once complete, the centre will house over 9,000sqm of retail space with 60 luxury boutiques and a number of premium restaurants housed in a dining terrace. It will be valued at over $200m and will have reinstated a missing laneway link between Collins Street and Little Collins Street, which was largely ignored by the previous centre’s design. St. Collins Lane is set to reopen in early 2016.